Situation report: It's been a pretty good summer, writingwise. I worked with my publisher to finish the manuscript of my new story collection coming later this year, I participated in two panels--and moderated one--at our annual Mississippi Book Festival (6400 people attended panels that day), and I've written some short stories, sold some, and had some published. 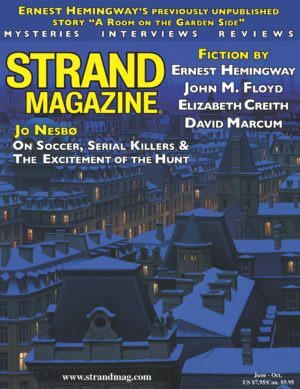 At the moment, I have stories in the current issues of three publications: The Saturday Evening Post, The Strand Magazine, and Black Cat Mystery Magazine. And since I couldn't come up with another topic for my column today, I decided to give you a few "stories behind the stories" for these three shorts. The first half of this story is boy meets girl, boy loses girl, and many years pass. What happens next I won't reveal, here, but since I've told you it's essentially a romance you can probably figure it out. What I hope is entertaining about it is the process, and a surprise or two. I will say that the opening scene, which features two college students who meet at the information desk of their Student Union, happens almost exactly the way it happened to me, in real life. The rest is fictional, but the final part of the story is based closely on my mother, who's 92 and still lives in the house where I grew up. Another unique thing about this story is that I once promised our oldest son's three children, who all love to read, that I would one day include characters with their names in one of my stories. So the main characters in this one are named Lillian, Anna, and Gabe. It's a small and silly thing, but I think those three kids'll get a kick out of that when they read it. My story in The Strand Magazine (the June-October 2018 issue) is called "Foreverglow"--original title "The Foreverglow Case"--and was one that I dreamed up while sitting in our backyard swing a few months ago, before the temperature and the humidity and the mosquito population rose high enough to send everyone screaming into their houses. I must've been in a noirish frame of mind that day because the idea that popped into my head was of a blue-collar guy who lets his smarter girlfriend talk him into robbing the jewelry section of the department store where she works. They devise a plan by which she can smuggle a display case of samples of their new Foreverglow collection out of the store to him while she remains inside, and then they can make their getaway the following day after things have calmed down. I hope what happens will be a surprise to the reader, but you probably already suspect that things don't work out exactly as planned. Do they ever? 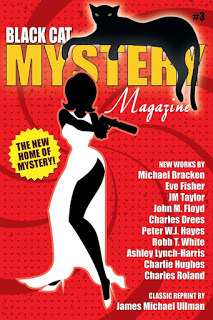 The third story I have out right now is "Diversions," which appears in Issue #3 of Black Cat Mystery Magazine, alongside stories by my SleuthSayers colleagues Eve Fisher and Michael Bracken. This one is also a mystery/crime story, but it's a western (how could I not want to write a western after watching all those episodes of Have Gun--Will Travel? ), and features a bank robber who's been caught in the act and is now in custody in a temporary jail and under guard by a female (and also temporary) deputy. The most unusual thing about the story is that the entire plot takes place in less that an hour's time and inside those four walls, and the fact that the inspiration for one of the characters' names came from a road sign on State Highway 25, about forty miles northeast of where I live. On the sign were--and still are--the names of two Mississippi towns, one above the other: LENA, with an arrow pointing west, and MORTON, with an arrow pointing east. One day when my wife and I were driving past on the way to visit my mother, I noticed the words on that sign, and made a mental note. Now, about a year later, the deputy's name in this story is Lena Morton. I find myself doing that kind of thing occasionally just because it's (1) fun, and (2) different. Which, now that I think about it, is a good way to describe (1) writing, and (2) writers. So those are my current publications, and a few facts about how they came to be. 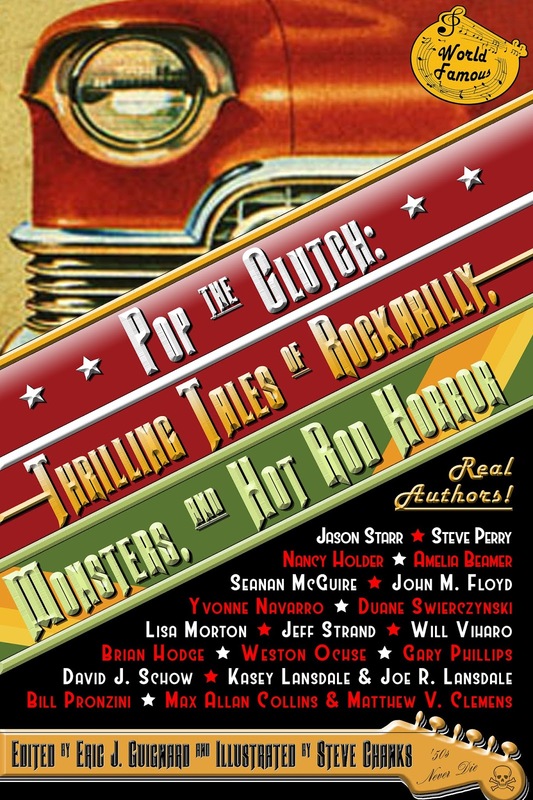 Upcoming are stories in AHMM, EQMM, BCMM, Woman's World, Mystery Weekly, Flash Bang Mysteries, The Best American Mystery Stories 2018, and nine anthologies, including one that also features my heroes Joe Lansdale, Bill Pronzini, and Max Allan Collins. Here's the cover of that anthology, Pop the Clutch, which'll be released on November 1. 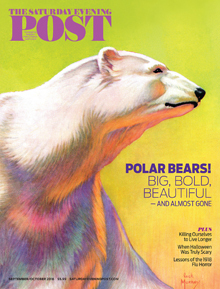 Do any of you have stories out, or coming up soon, in magazines or collections or anthologies? Any novels recently released, or scheduled? If so, let me know what they are--and keep up the good work. I hope your story ideas--and mine--keep coming. Cool stories behind the stories. Love how you picked up the name Lena Morton from a road sign. I picked up he name Lucien Caye from tiles in a New Orleans sidewalk. I misread the old tiles. The name of the business that used to be there was Lucien Gaye. I love coming up with names of fictional characters. Just used the name Humphrey Littlewit in a novel. That was one of H. P. Lovecraft's pseudonyms. Have fun at Bouchercon. Thanks, O'Neil. i don't think I could beat Humphrey Littlewit--love that name. And I don't think I would've thought of sidewalk tiles as a source for character names! I do remember getting most of the names for the characters in a story long ago from the backs of the jerseys of the teams on Monday Night Football, though. Makes you wonder what the inspiration was for names like Apollo Creed, Atticus Finch, Marty McFly, Ferris Bueller, Napoleon Solo, etc. While driving to and from the New Orleans Bouchercon, I saw many roadsigns that inspired character names, and when I returned home I wrote half of a story. Alas, I haven't yet figured out the twist that drives the story to the end. But the characters (and their names) are great! Michael, sounds as if you have half the job done already, on that story. A couple years ago, driving through a city in (I think) North Carolina, I saw one of those overhead green signs on the interstate that list the street names for upcoming off-ramps. This one said SPENCER, and below that, E SPENCER. As it turns out, the next story of mine to be published in Black Cat Mystery Magazine features a banker named Spencer E. Spencer. Ideas are everywhere. Love reading the stories behind the stories! Thanks, Deborah! This isn't any great revelation, but there's almost always something that kicks off the ideas we have, whether it involves a plot or--as we've said--the names of characters. Humphrey Littlewit = H. P. Lovecraft? Who knew? But then, I'm still stunned that Cary Grant was Archibald Leach. Almost all my Laskin characters have last names that are the names of counties - Tripp, Davison, Mellette, etc. John, I love the stories behind the stories, and the way you've picked names--including ones in the comments. I'm about ready to put out my fourth book in the Tina Tales series--ORGANIZED TO KILL. Haven't worked on short stories in a long time, and I long to get back to that. Keep imagining; keep writing! Hi Eve, and Jan--thanks for the notes. I think this business of creating appropriate/interesting names is something beginning writers don't take seriously enough. For the two dozen years I've been writing, I really do try to come up with and/or remember intriguing names. It doesn't always turn out well, but often the difference between a dull, routine name and a really memorable one is just a matter of working at it. It'd be fun (wouldn't it?) to know how the authors/screenwriters came up with Hannibal Lecter, Vincent Vega, Stephanie Plum, Hawkeye Pierce, Bilbo Baggins, etc. Thanks, Anonymous! Believe it or not, I too have chosen Butler as the last name of several characters, over the years. One was named Purvis Butler, in a story I sold to the Strand last year). The character he's introducing himself to says, as they're shaking hands, "Purvis?" Butler replies, "Middle name. No choice, really. My first name's Rhett." "Mom loved that movie. And frankly, Dad didn't give a damn." (So sometimes these names can actually help the story.) By the way, I love your inspiration for the name of the law firm! I enjoyed this blog and have also taken names from road signs. Pelham Winchester is the MC in a new series of short stories I've started writing. He is a slightly stuffy professor, and the name just fits him. Pelham Winchester is also an exit off I-24 west of Nashville. Several of my characters are named for streets - or two streets. Naming characters can be fun. I named a liar Frank and a complicated woman Claire. Thanks, Patricia!! Pelham Winchester is a great name, no matter where it came from! Where's a Grammar Cop When You Need One? Are Super Men Bad for Your Health? The Broken Windows Tour of L.A.
Bye Bye Burt... the lesson of a good bad example.